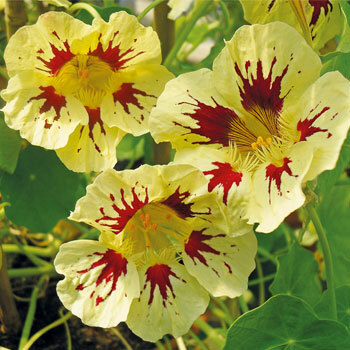 Nasturtiums perform nicely as an addition to any cottage garden and ‘Orchid Cream’ is good in containers too, as it has a trailing habit. Space about 8-12" apart in-ground; provide a trellis or other form of support for scrambling up with a few ties to guide, or use as a ground cover, in which case they can be spaced a little further apart—up to 2'. Flowering: Creamy yellow-white flowers up to 2” wide with maroon blotching, eventually turning mostly red.